Ever wish you had access to a scanner that you could use to scan and store documents? You now have a scanner that you hold in your hand. Before IOS 11 this would be accomplished with a separately installed app. 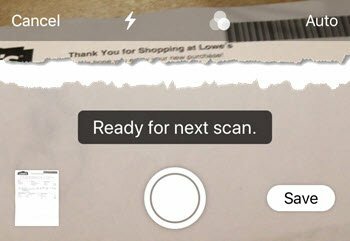 With IOS 11 you can use the camera on your iPhone to scan documents into Notes for storage or even markup. 1 Lay the document you want to scan on a flat service. 2 Launch the Notes app. 3 Create a new Note by tapping the Create icon. In the Notes app, the first line in the note becomes the title. Type a descriptive name. 4 Tap + then choose Scan Documents. 5 Position the document on the camera screen. When the document is centered and stable on the screen, the shutter on the camera will automatically take a picture of the document. If the camera can’t frame the document, you can manually press the shutter to take the shot. When you do, you will be given an opportunity to adjust the corners of the document. 6 Move the circles at the corners to frame the document. Continue to scan more pages. 8 Tap Save when you’re done and wish to end scanning. The scanned document will be displayed in the Notes document. Access the Note with the Scanned Document. Tap , then tap Markup. To Markup the document, tap a pen and use your finger or stylus to draw on the document. See Nugget #4 Write or Draw in the Notes App for more instructions. To sign, tap . To manually sign your document, select a tool to use, then sign with your finger or stylus.